Thank you to everyone who supported the SSAFA Show last October. The weather was not kind to us on the day but we still had over 100 cars and vehicles on show. With fantastic help from everyone we have given £558.50 to SSAFA. SSAFA also raised some money themselves on the day so a good overall result. Here is to hoping the weather for the next SSAFA show is much much better. We received this thank you from the Friends of Manor Park for last May’s show. We have raised £1657 from the 10th Anniversary Show for the Friends of Manor Park Appeal for a wheelchair accessible roundabout. Thanks to everyone who supported us in this fantastic achievement. We presented the cheque to the Friends of Manor Park at our club barbeque on the 16th August. Welcome to Glossop Vehicle Enthusiasts Club. We are a friendly club with a full calendar of events for 2019. We also organise and run two shows in Manor Park Glossop. 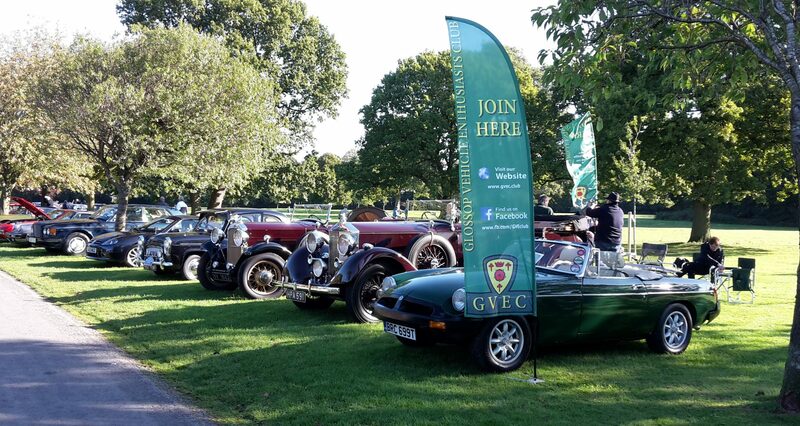 The GVEC Classic Car Show in May and the SSAFA (Military) Show in October. All money we raise goes to local charities. We have monthly drives and two very active Facebook pages keeping members in touch with what is happening. We also attend other shows through the year. A complete up todate list of events can be found with the Club Calendar. Club membership is only £12 single and £15 joint for the 2019-2020 year. To keep costs low we use e mails and Facebook for communication with members and for those without the internet we do make paper forms available. Please use the menu above to navigate around the site. In particular follow us on our Facebook pages as they normally have the latest information about the club and its activities.